We decided to take a cruise this year. For the third time, we selected Carnival Cruise Lines and we also decided to take the same week-long Western Caribbean cruise as we did two years ago. Carnival's newest ship, Conquest, would be making its inaugural seven-day cruise and we reserved a starboard cabin with a balcony. 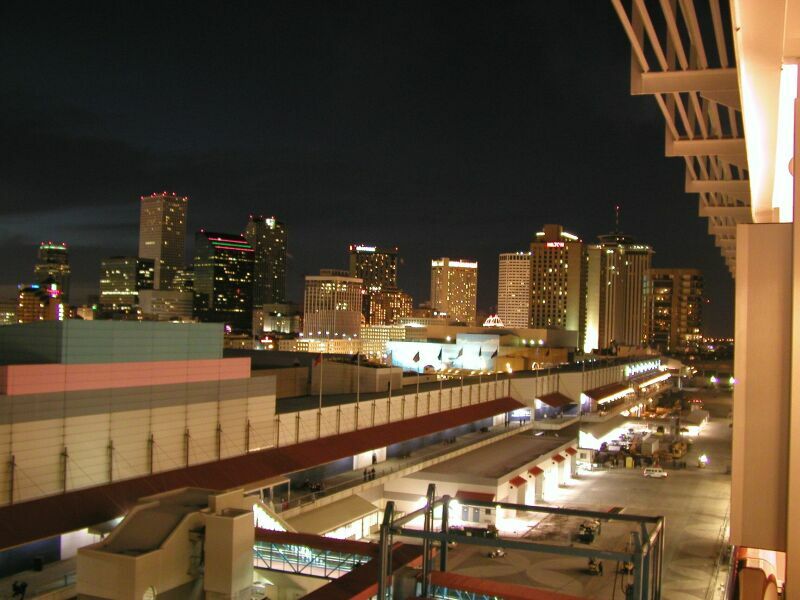 The ship leaves from New Orleans, which we prefer to any of the Florida ports. We flew down two days early and spent the weekend in New Orleans. 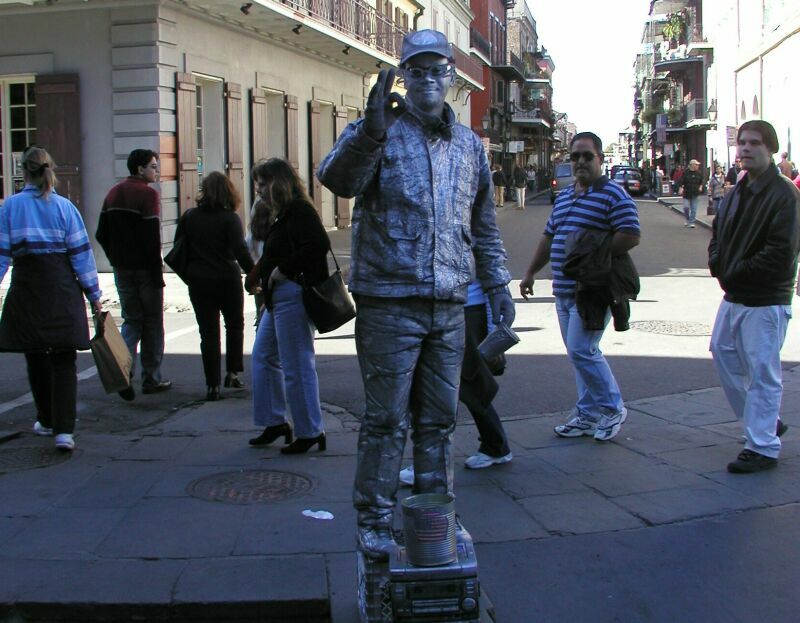 We spent a couple days checking out the French Quarter and the street performers. This is the second time we've cruised from New Orleans and the cleanliness and orderliness of the terminal has impressed us. 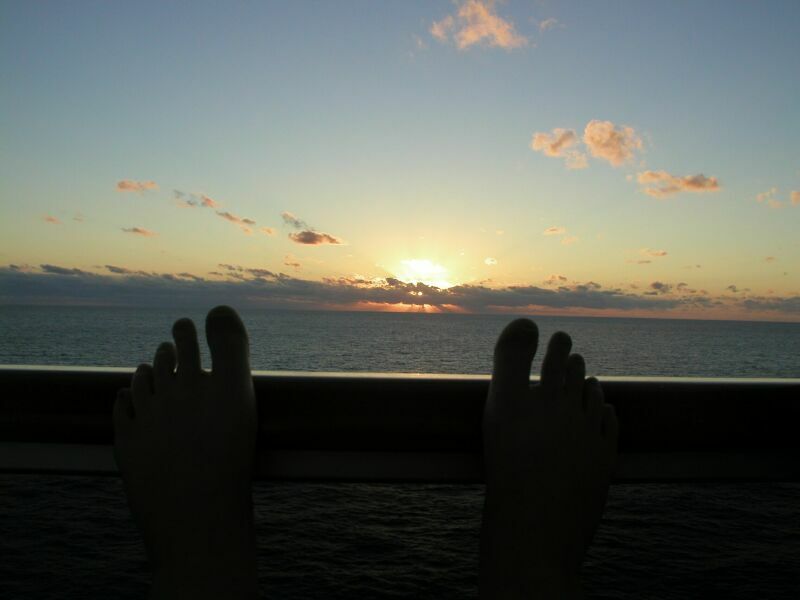 This is the purpose of the whole cruise...to watch the sunset through my feet from the cabin's balcony. 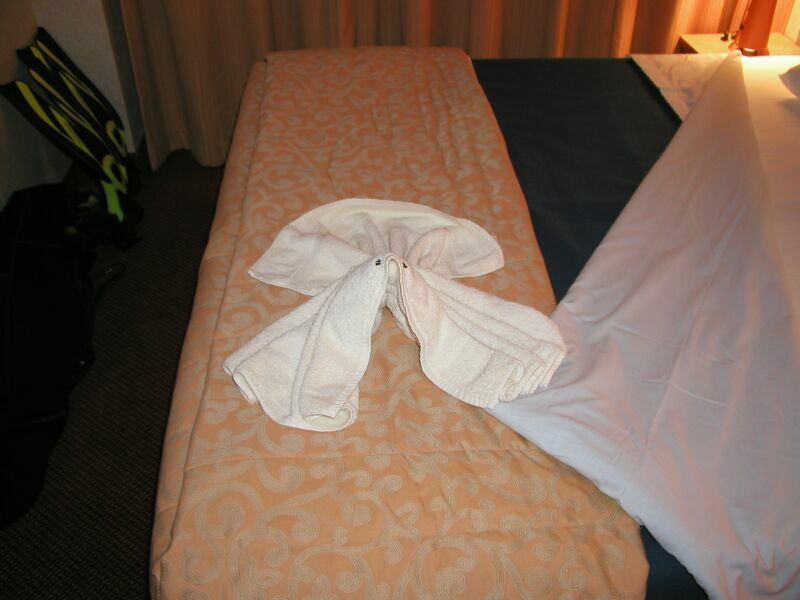 One of the neat things about a cruise is that each cruise line and staff have their own special little things that they do for the passengers. The intended result is a larger gratuity, but it's still pretty neat. 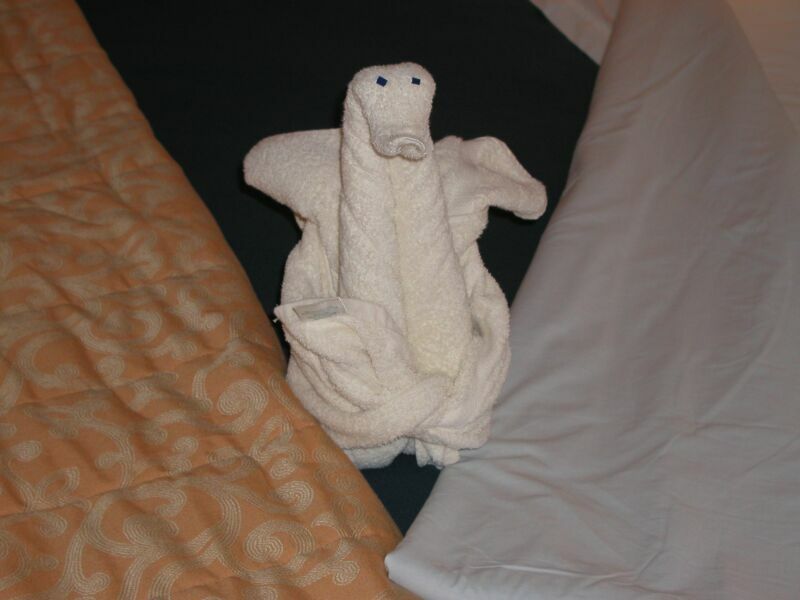 On Carnival, we get towel animals on the beds when the cabins are made up in the evening and the beds are turned down by the stewards. 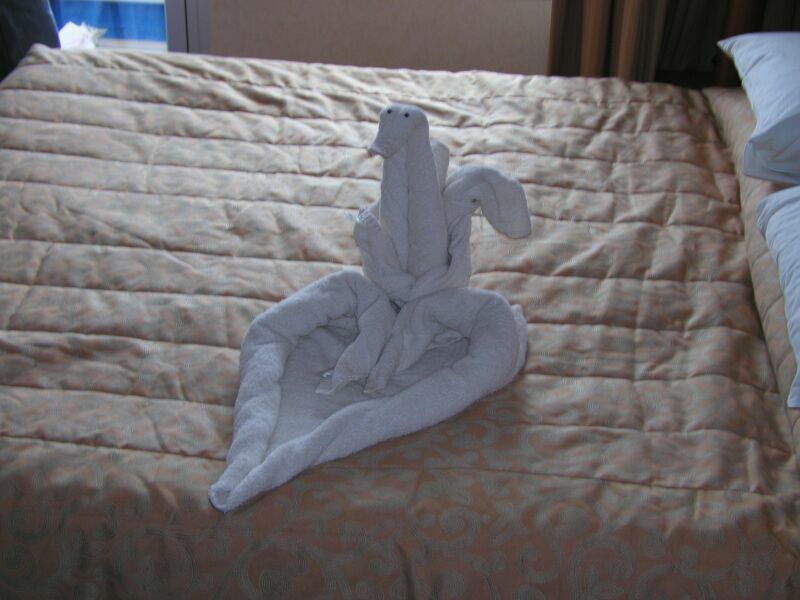 This is sort of "towel origami" art. Great puppy! This was the first and one of my favorites. He looked relaxed. I haven't figured out how he got the trunk to curl like that. I know he has to rub it on a hard surface. Note the glasses. 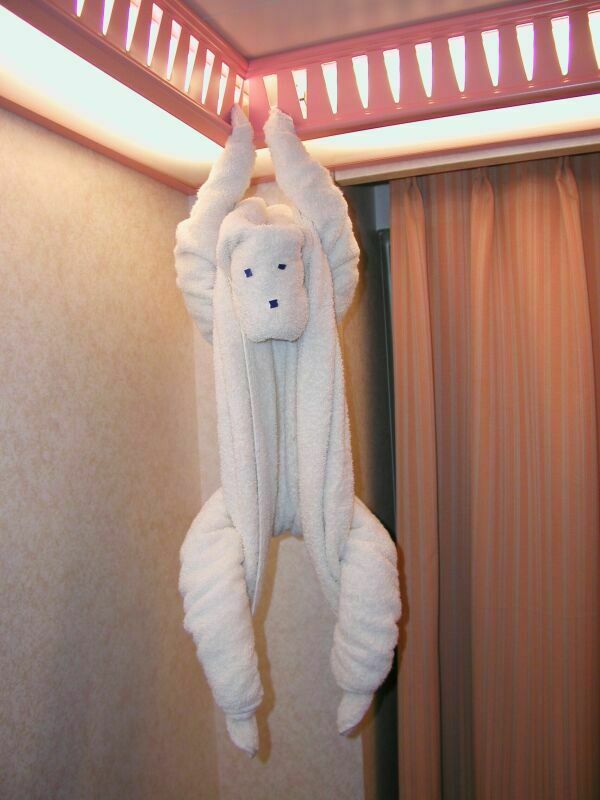 The towel monkey surprised us, since we were expecting the animal to be on the bed...not hanging on the light. I guess they use the same technique on the swan's neck as on the elephant's trunk. 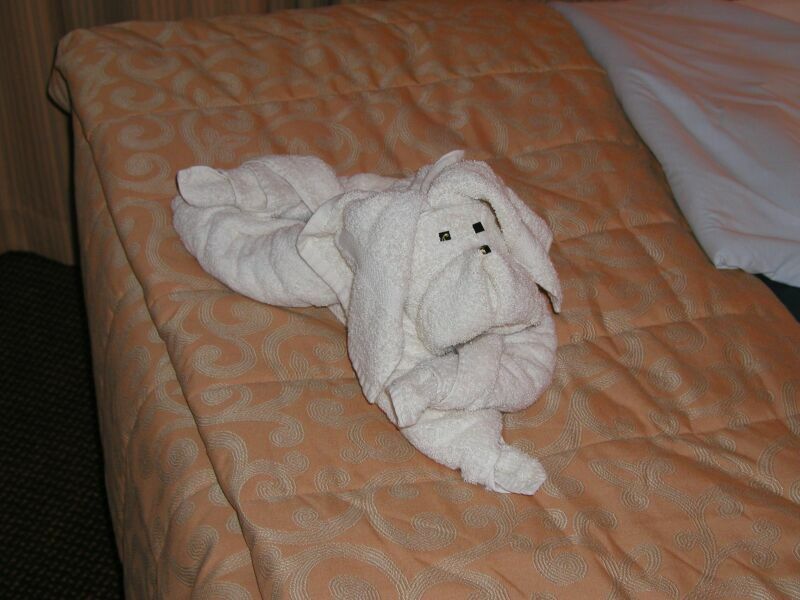 The last animal of the cruise...the gratuity envelopes were left in the heart. OK,,,this is a puzzler. I say it's a shrimp or seal. A friend says its "a spider". Maybe a lobster or crawfish?? 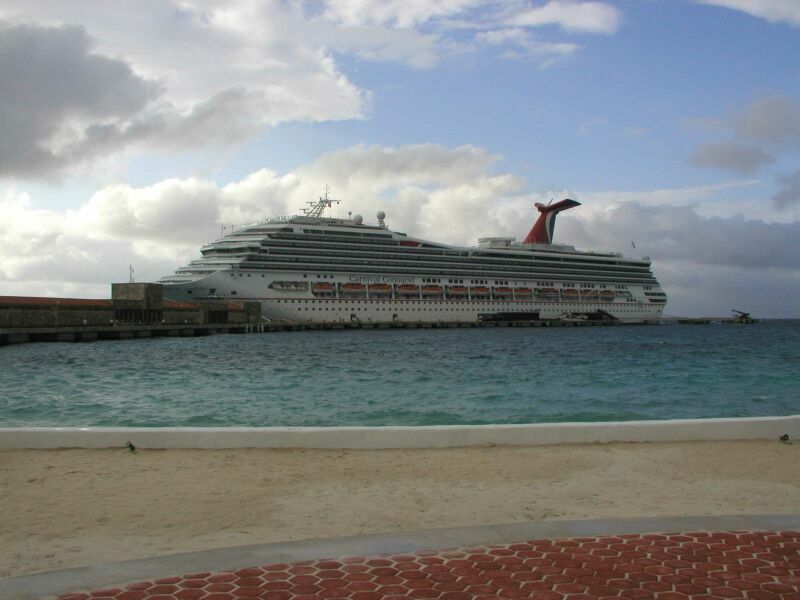 Our first port was Montego Bay, Jamaica, which we reached after cruising for two days. Having recently received my open-water diving certification, I was anxious to do my first "blue water" dive. Jamaica is not a particularly great diving location, since the reefs and marine life have not been protected for very long, but it beats the heck out of an old quarry. I got an early Christmas present on the ship, as my wife bought me a very nice diver's watch with depth gauge and thermometer. It also allowed me to record my dive profiles for each dive. We went to Rose Hall Manor Beach Club and I did a two-tank dive with Cool Aqua Sports while my wife enjoyed the beach. The dive master (DM) was Lloyd, who was very nice about my being a newbie. We did an initial dive to 40 feet in a group of five divers. There wasn't much to see, other than an octopus or two and some basic tropical fish, but I was just concentrating on not screwing up. When we surfaced, the wind had picked up and it had started to rain. The seas were rolling at about four feet and exiting the water was a challenge. My next dive was also to 40 feet, but it was just Lloyd and me. In the meantime, my wife got her hair braided Jamaican-style. (I never saw THAT coming!) The Beach Club was very pleasant and not at all crowded. The staff were friendly (even to some VERY "ugly Americans" who didn't care for the place) and had an extremely pleasant ("no problem, mon!") attitude. I highly recommend the place! 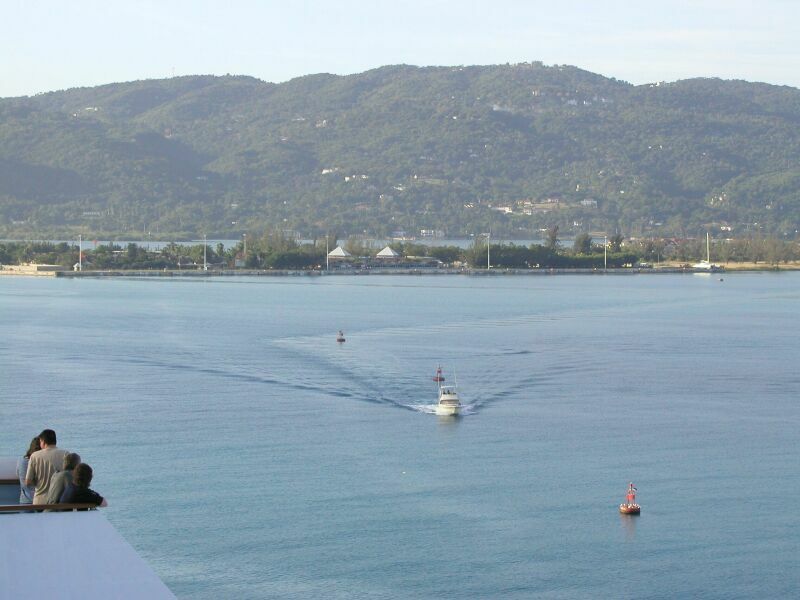 The pilot boat coming out to meet the ship at Montego Bay, Jamaica. The basic principle of diving: "The number of times you surface should equal the number of times you submerge." I did not expect to surface in weather like this on my first dive. Fortunately, I was already wet. Pretty neat, huh? 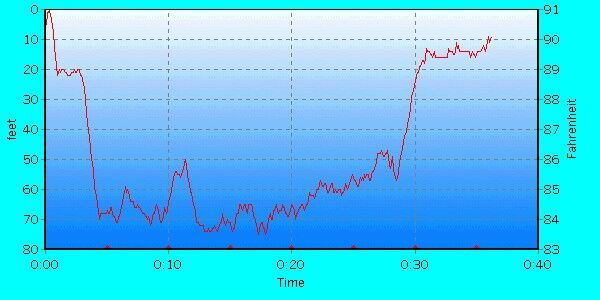 This is the dive profile graph my diver's watch can generate. This was my first blue water dive. So we both enjoyed Jamaica quite a bit. (Check out the picture below and you can see her Jamaican braids.) 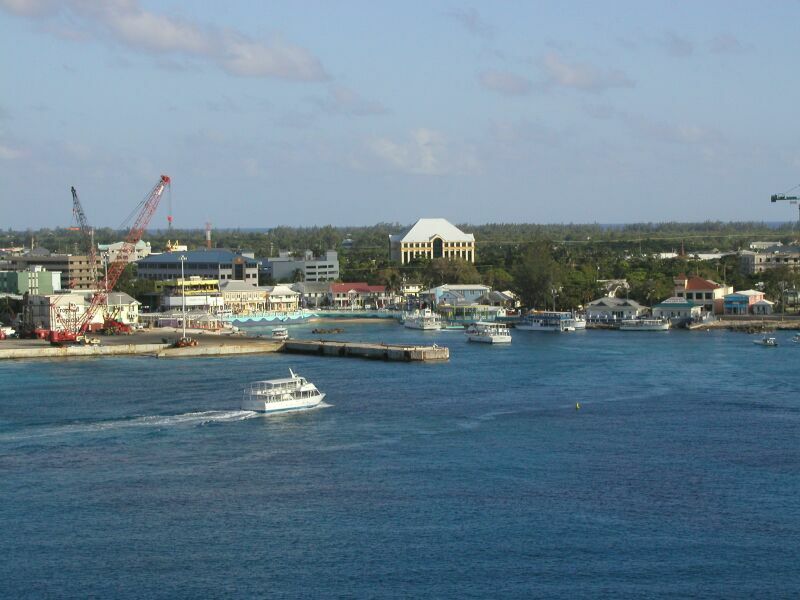 Then it was on to our next port, Georgetown on Grand Cayman, where we arrived the following morning. This is where I REALLY screwed up!! "But you're such a nice guy," you say, "How could you possibly screw up?" Well, I was anxious to go diving in each port, if possible. The ONE THING that my wife really wanted to do in Grand Cayman was to go back to Stingray City and see the stingrays again. We got tickets for the 12:45 PM excursion without problem. Unfortunately, I also opted to sign up for the 7:15 AM two-tank dive that morning. It was only supposed to last 2-1/2 hours...but I didn't get back to the ship until 12:35 PM. This was due to a combination of things...slow buses, the laid-back attitude of the dive operators, and just plain bad luck. She was very nice about it and we were able to get our money back for the missed tour, but I could tell that she was very disappointed. Baby, I am SO sorry!! I also had some problems on the dive. Nothing technical or serious, but I did manage to lose my underwater camera off the side of the pontoon boat when I wasn't looking. It was not expensive, but it was gone for good. The dives themselves were great. The first dive was to almost 55 feet and I felt much more comfortable than I had the day before. There was more marine life, too. We didn't see any sharks or turtles, but we did see an eagle ray swim in a circle a couple times and then shoot to the surface to leap several feet into the air! (Remember, we were watching this from below the ray.) It was amazing! The second dive was a little shallower, but we went to a wreck, which was quite interesting. 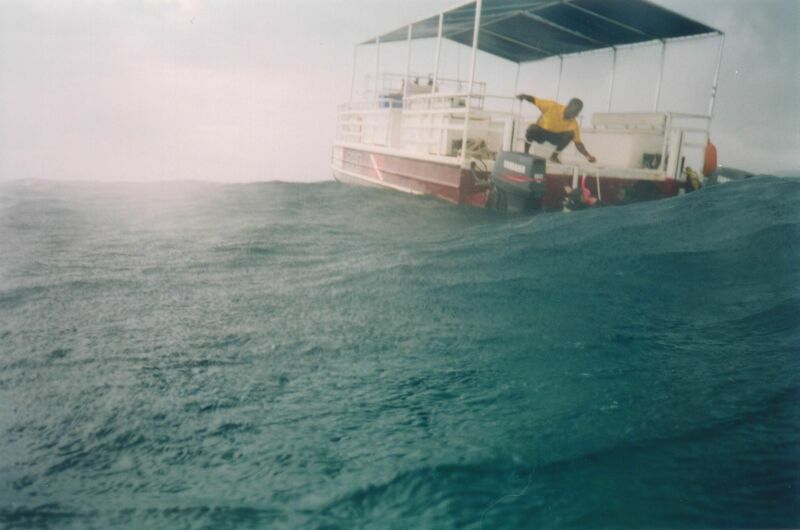 Since I had lost my camera earlier, I went ahead and bought a videotape of the dive that was made by the dive operator. Afterwards, I tried to make up to my wife by going out for lunch at Hard Rock. We were so nice to the waitress there that she gave us one of her Hard Rock pins. 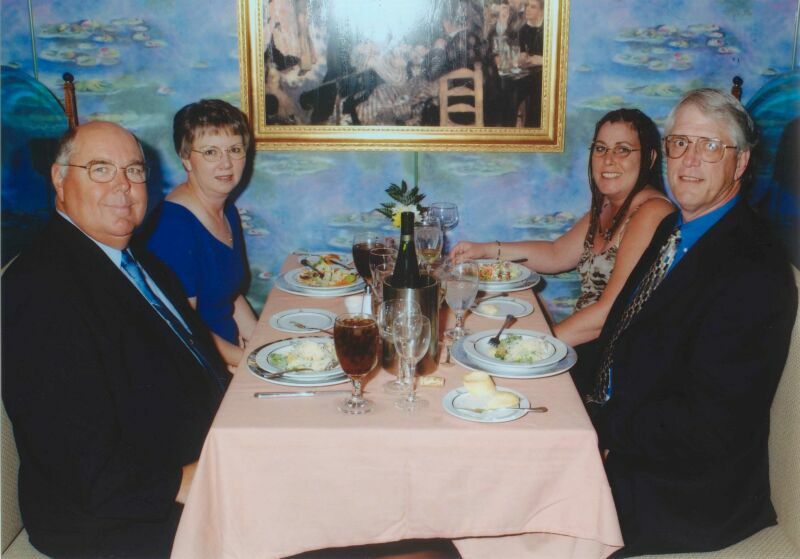 Our dinner companions were Bob and Jodi from Texas. They were exceedingly pleasant and we enjoyed their company. 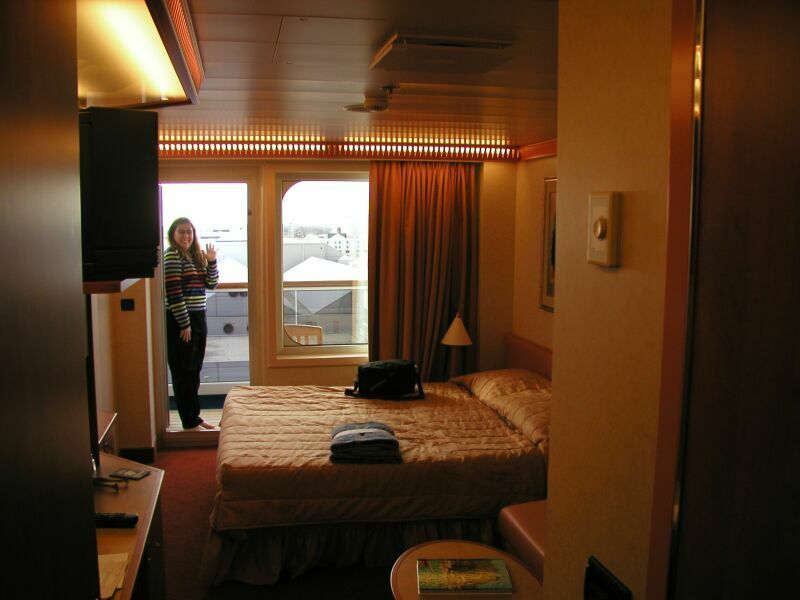 The cabin we were in was very comfortable and spacious. Even the balcony was bigger than I expected. Georgetown was the one port where we had to use tenders to get to the shore. Fortunately, the weather was good and the sea was calm. 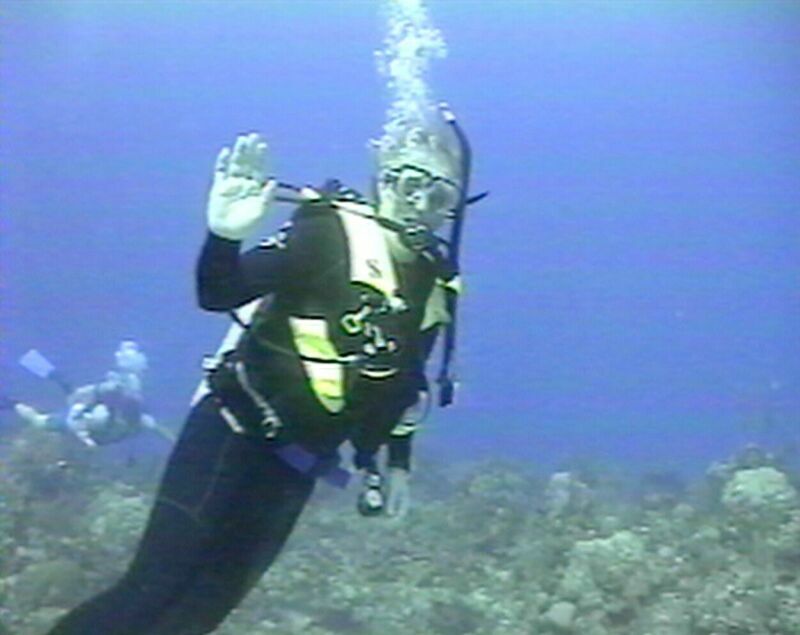 Here I am on the first dive hamming it up for the camera. Notice the cute matching fluorescent yellow outfit. 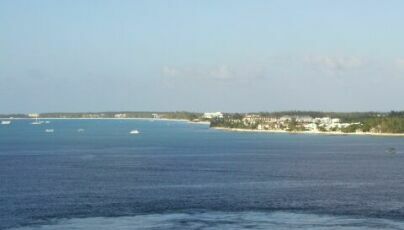 Our last port of call was Cozumel, Mexico, where we arrived the next morning. I had previously made arrangements to dive with a local operator, Dive with Martin, rather than on one of the packaged excursions. This was an excellent decision on my part. While I initially had problems finding Dive with Martin, the dives themselves were excellent. 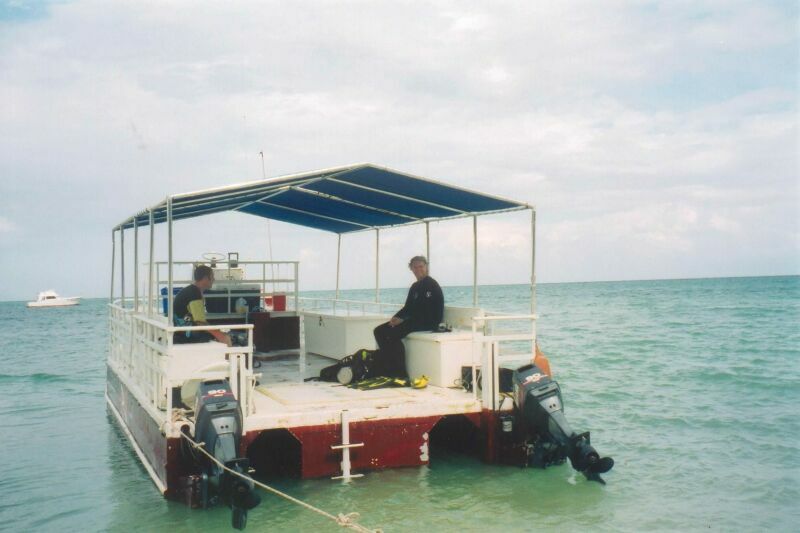 There were only five divers on the boat and we started at Pallancar Reef with a 75-foot drift dive. This was, of course, my deepest dive so far and my first drift dive. It went like a dream! I was a little worried about my air consumption, since I have not developed much "air discipline" yet, but I actually outlasted all the divers except the DM, Roberto. Our next dive was to only 55 feet, but the current was stronger. Still, my air consumption was better than all but a couple of the divers. We hurried back to the dock because Roberto said that a storm would break in about an hour. He was absolutely on the money! 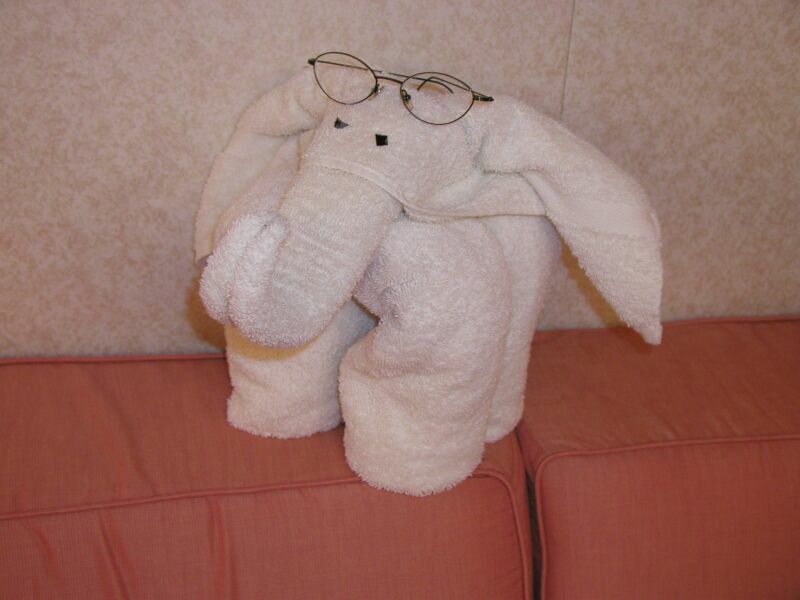 I found my wife on the ship and we went ashore to do some shopping. We were almost caught in a downpour, but were able to duck into Fat Tuesday's and grab a table to wait it out. All in all, a really great time! 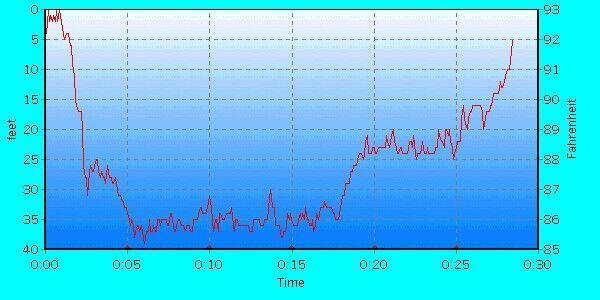 The dive profile from my deepest dive so far...75 feet and nearly 37 minutes. This was Pallancar Reef. Impromptu entertainment as we wait out the storm in Fat Tuesday's. Guess which three are cruise passengers. 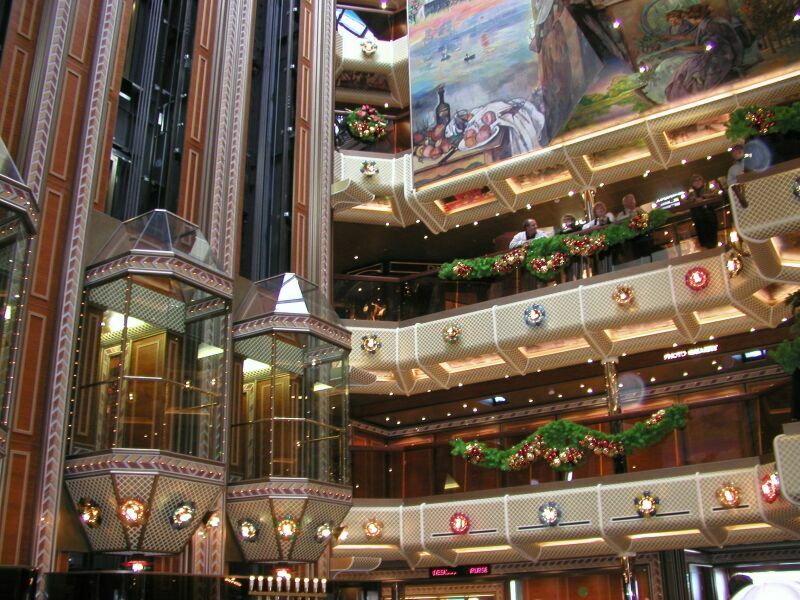 Like most modern cruise ships, the Conquest has a stunning multi-story atrium. But all good things must come to an end. We spent our last Saturday cruising back towards New Orleans and colder weather. There had been a major ice storm while we were gone and the cool weather lingered. On our last cruise, we did not do a very good job in getting our luggage outside our cabin to be taken to the dock. This time, we were ready with hours to spare. Carnival did not do quite as good a job getting us off the ship as they did getting us on. 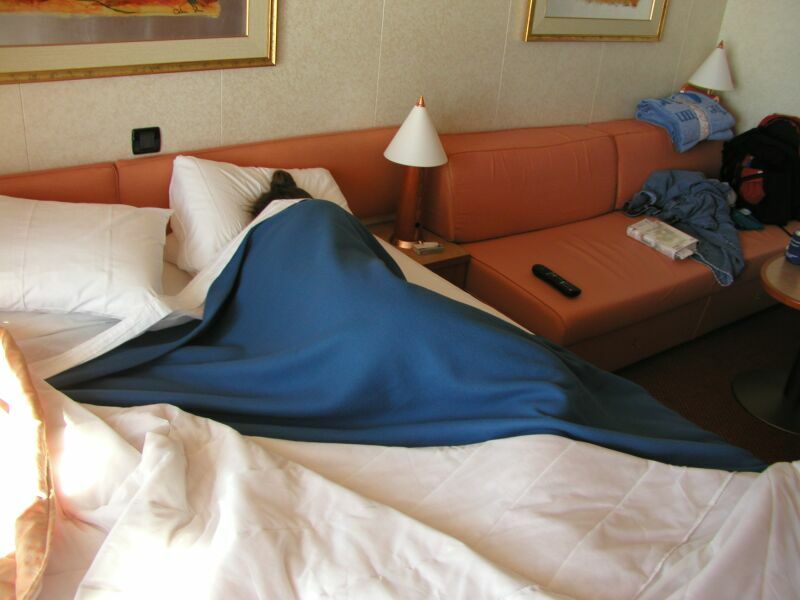 Because of customs delays and the sheer size of the ship, we had to wait almost three hours to disembark. We were actually the last deck called to come to the terminal. Fortunately, we once again walked right through US Customs...I didn't even have to provide a declaration form or answer a question. In fact, we didn't even have to prove that we were US citizens. Then it was off to the airport and back home!